This is a reproduction of an original oil painting, Beach. About 20 years ago I was sitting on the beach, without my glasses. I'm far-sighted, so all I could see when I looked around was small dabs of bright colors. I thought, "Wow, what a painting!" I have done many beach paintings since then; this was one of the first. The intensity of the sunlight bleaches the atmosphere, and makes colors appear more intense. Some ophthalmologists have claimed that the Impressionists were far-sighted, and that this is what caused them to paint as they did - in soft focus dabs of color. This probably can't be proven or disproven - but I think my far-sightedness has affected my work. For one thing, I can study paintings as I work on them by removing my glasses - I can see the "whole" better, rather than all the details. 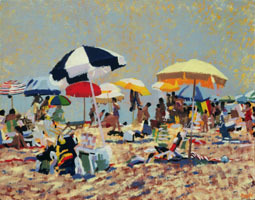 It is fun to paint these beach scenes, but it is very time-consuming adding so many tiny dabs of many different colors.